This dessert is beautiful and delicious using local fruit. It would be a lovely addition to a Labor Day gathering, so make it while fruit is at its peak. I find it easiest to prepare the custard the day before assembling the trifle. The flavor improves as it chills. The amount of fruit, custard, and cream depends on the size of your bowl. I used a 12-cup punch bowl for the photo below. The amounts of fruit and cream listed below fit the size of that particular bowl. Make the custard early in the day, or the day before assembling the trifle. In a 4-quart pot combine the egg yolks, sugar, cream, and milk. Whisk until smooth. Scrape the vanilla bean and add beans along with the pod to the cream mixture. Cook on medium heat, whisking constantly until the custard coats the back of the spoon and is nearly bubbling. This should take about 8-10 minutes. Remove from heat. Strain custard into a bowl, then whisk in vanilla extract. Return the vanilla bean pod to the custard. Cover with plastic wrap that lies directly on top of the custard. Chill until cold. Cut nectarines in half to remove pit. Thinly slice nectarines into a large bowl. Sprinkle with 1 cup granulated sugar and lemon juice. Stir to mix well and dissolve sugar. Let fruit sit 10 minutes. Some juice should accumulate. You will use both the fruit and the juice to moisten the lady fingers. While the fruit is macerating, whip the cream with confectioners sugar and vanilla until fairly stiff. 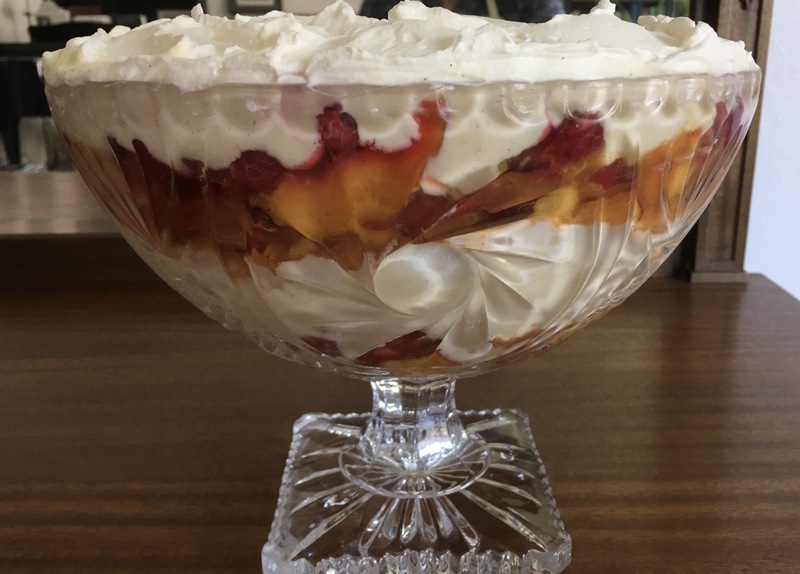 For the assembly: Use a trifle bowl or a 12-cup sloping glass bowl. Line the bottom of the sloping bowl with 8 lady fingers which have been broken in half. Place about 2 cups of nectarines with juice over the cookies. Place 2 cups raspberries over the nectarines. Drizzle 3 cups of cold custard over the fruit and spread with a spatula to cover the fruit. Use 1/3 of the whipped cream and spread over the custard. Spread with a spatula to cover the custard. For the second layer place 12-14 lady fingers, broken in half and over the whipped cream. Spread the remaining nectarines and juice over the lady fingers. Place remaining raspberries over the nectarines. Top the fruit with the remaining custard and spread evenly over the fruit. Spread remaining whipped cream over the custard, distributing it to the edges of the bowl. Cover with plastic wrap and chill at least 6 hours. Serves 12. This entry was posted in Christmas, Custards, Desserts, Easter, Fruit, Thanksgiving. Bookmark the permalink.